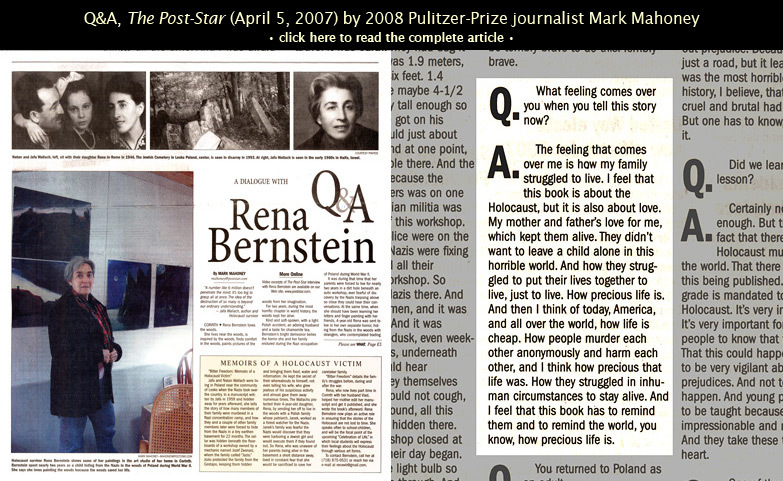 The Jewish Press serialized the book from June 8, 2007 through March 11, 2008, bringing the Bitter Freedom story to people all over the U.S. and Canada. This tale of a Holocaust survivor is so genuine, so sincere, and so rich in psychological and factual detail that it will be read by millions with tears and heartache. 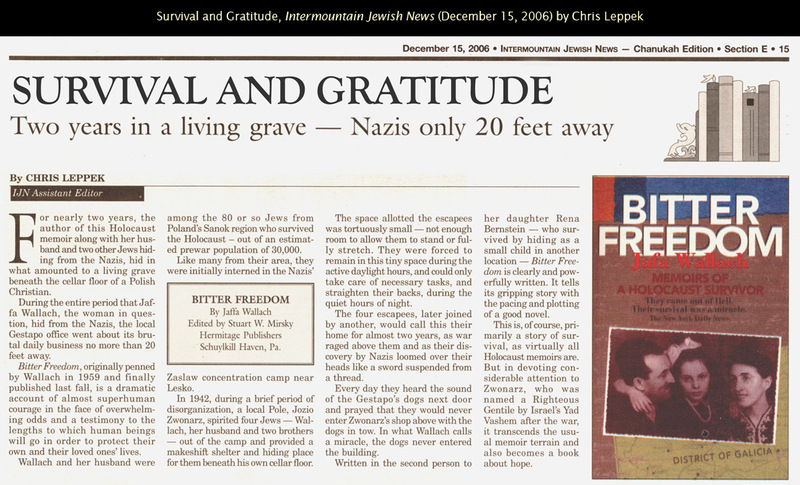 If Anne Frank had had a chance to describe what happened to her and her family after their arrest, her Diary: Part II would have resembled Jafa Wallach’s BITTER FREEDOM. "[Bitter Freedom] is an amazing story of both terror and courage; the worst of humankind and the best. There are so many lessons to learn from this story; the great power of love, the will to survive, the horrors of hatred. This book is an inspiration and a gift to us all. Thank you Jafa for having the courage to tell your story." "The book is a tribute to ordinary people performing acts of kindness and heroism and becoming extraordinary people in the process. This book will touch your heart." "This is an important story for our times, a story of moral and physical courage, of faith and love. Against the black horror of the holocaust, the inspiring resilience of the Wallachs and the heroic bravery of those who hid them shine as a beacon of hope. Someone should make a movie of this story. A great read and even greater lesson." 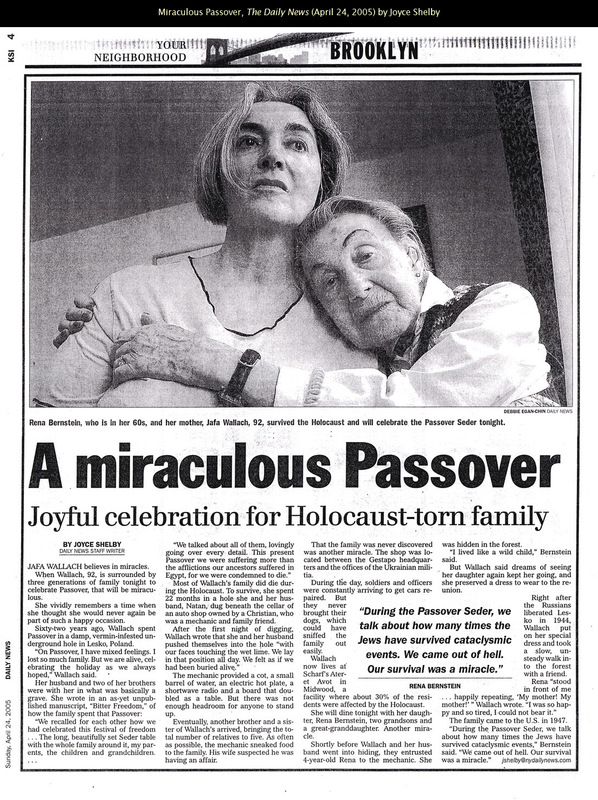 "I lived through the incredible experience of this family: I cried with them, I was scared with them, I was overcome with joy when they survived and reunited with their child and the few surviving members of the Jewish community. Please read this book, and you will be spiritually rewarded. You will find out that human spirit is indestructible, that a regular person can preserve dignity in the face of horror, and, most importantly, that love does conquer all." "This is an incredible story which, while simply written, encompasses all of the best and worst of what humans are capable of. The unbelievable love between a mother and her child is the overwhelming power that pervades the narrative. A gift to anyone who needs to understand what that period of history was all about."